This is the highest percentage of all major U.S. generational groups. At the other end of the spectrum, we have the less trusting (and in this case, more realistic) assessment of Americans aged 70 and older. In this group, just 29% believe their personal information is kept private all or most of the time, while 35% believe it’s kept private little or none of the time. Sure, sounds good. But to the contrary, most Americans don’t believe these tradeoffs are fair at all. Most people are strongly opposed to the idea of trading personal data for more personalized experiences. A recent report from the Annenberg School for Communication at the University of Pennsylvania spells this out with some stark and somewhat disturbing facts. 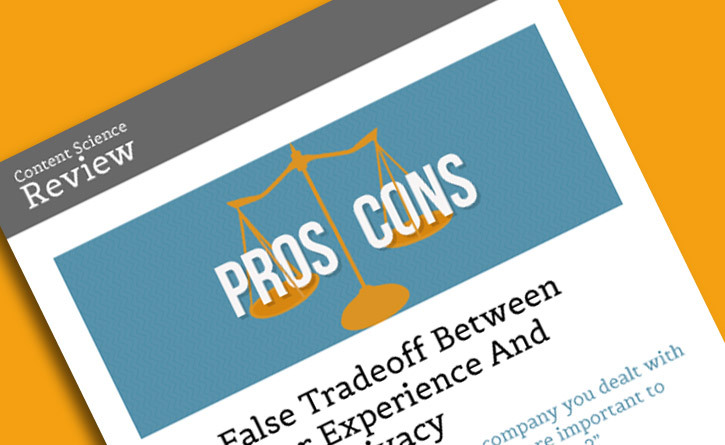 The report, titled The Tradeoff Fallacy: How Marketers Are Misrepresenting American Consumers And Opening Them Up to Exploitation, suggests that most people are strongly opposed to the idea of trading personal data for more personalized experiences. This said, like most narratives of this sort, there is a foundation of truth: This foundation is the increasing desire of your customers for ever more personalized experiences. In fact, personalization and customization are fast becoming customer expectations. But they don’t expect or want to give up their privacy to get it. Maybe. But this is a big tradeoff. And most of the time, it’s not voluntary. Americans widely believe that there is little or nothing we can do to stop the wholesale use and misuse of our private data. The word that best describes the privacy/personalization tradeoff is “resignation.” Meaning that regardless of the type or quality of the supposed benefits we received, Americans widely believe that there is little to nothing we can do to stop the wholesale Hoovering of our private data or the use and misuse of it by those entities that gather it. And they’re not entirely pissed off–yet. Today, most customers are content to leave a trail of personal data behind them. They give Facebook and other social media like Instagram, Snapchat, and others permission to not only store but also broadcast and resell vast amounts of data from their personal profiles. Unwittingly, most customers give online merchants permission to remember their credit card numbers, transactions, and Web browsing activity. They don’t remove cookies from their browsers, making it possible for advertisers to track their movements online and target them with specific advertisements. And if they try to remove some of these tracking tools, some websites simply won’t work. Any sane customer with the time and resources to quantify these tradeoffs would quickly come to the conclusion that it’s pretty difficult, if not impossible, to participate in the “Internet economy” while protecting your private data. That’s because marketers hold this data and aren’t at all transparent about the ways in which they use it. But what happens when customers take control of their data? These words come from the The Cluetrain Manifesto, a collaboratively authored work first posted to the Web in 1999 and published as a book in 2000. Doc Searls is one of the book’s co-authors, and he uses these words to describe ProjectVRM, a research and development project of the Berkman Center for Internet & Society at Harvard University, which intends among other things to provide tools for individuals to manage relationships with organizations and make individuals (rather than organizations) the collection centers for their own data. This is a potential problem for companies that continue to hoard customer data and use it for purposes that don’t usually help their customers. Maybe it’s not a problem today, but it will be. Eventually. After all, another trend driven by the Internet is transparency. Which brings us to a core principle of customer experience management: the ability to truly understand customers’ wants and needs and appropriately meet their expectations in these regards. Implicit in this field of endeavor is the obligation to set customer expectations based on fact, not spin. On openness, not obfuscation. As logical as the narratives of Yahoo and others are when they say that their customers are willingly abdicating control of their private data, it doesn’t square with the facts. So What Does This All Mean For Business? Looking at your business “from the outside in” is more than just a marketing-driven line used to describe how a customer-centric company would act, if it were truly customer-centric. It means actually looking at what it’s like to do business with your business on all fronts–not just the customer journey or your products or call center or other channel experiences. It’s about what your customers think, feel, and do as they interact with you as a company that wishes to serve them. We believe that openness and honesty is a critical component of the customer-company relationship. As such, improving the experience also means doing a better job recognizing what your customers would want your company to do, even if they don’t know anything about it. Yes, it might require a new way of looking at your world–through the eyes of your customers. Every day, we see that those companies that best understand their customers–and act in their customers’ best interests at all times–are those that consistently beat their competitors. They do so by creating loyal customers and strong relationships based on the understanding that customers are really who these companies are here to serve. We know these are the companies we most enjoy working with. And we know their customers feel the same way. So. What kind of company does yours wish to be? This article on customer data was originally published on CMO.com. If you'd like to speak with someone at McorpCX, please reach out!